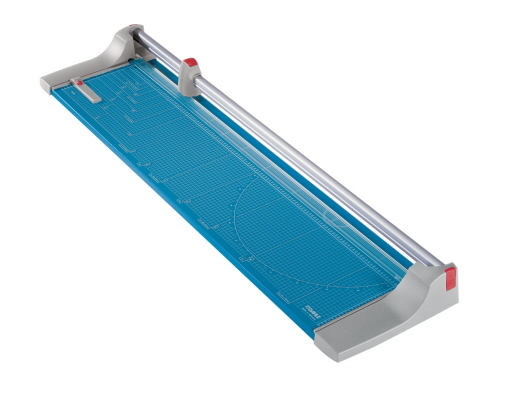 Rolling (or Rotary) Paper Trimmers from Dahle are the new generation of paper cutters. Designed for safety and accuracy, the cutting blades are encased in a plastic housing that virtually eliminates the chance of personal injury. The rolling action of these trimmers allow the blade to cut in either direction and sharpen itself as it cuts. It’s this self sharpening action that produces a clean burr-free cut and guarantees many years of smooth precise cutting. Dahle Premium and Professional Rolling Rotary paper trimmers are designed for heavy duty applications where precision is essential. These trimmers are equipped with a ground self-sharpening blade that cuts in either direction. Most models in this series have a cutting capacity of up to 20 sheets of paper at a time and are perfect for cutting paper, trimming photographs, and large format printing. Some models can be wall mounted and the three larger sizes have optional floor stands available. Dahle models are available from OREweb.ca® in 28", 37" and 51" cutting lengths and are a popular choice among professional photographers, print shops and graphic design agencies. Available models are: Dahle 440, 442, 444, 446, 448, 550, 552, 554, 556, 558. Dahle 507 personal paper trimmers are the new generation of professional quality rotary trimmers designed for rigorous day to day use. These table top models are designed for small trim jobs including photo paper, office stock, card stock, crafts and hobbies, scrap booking or just general day to day paper cutting tasks. 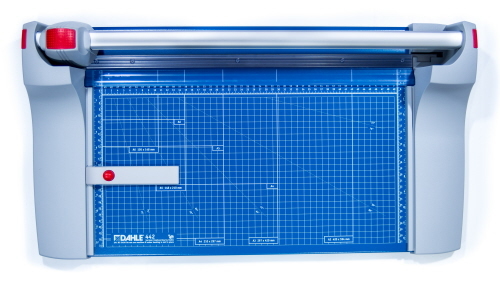 The Dahle 508 personal paper trimmers are also designed for rigorous day to day use. Same professional grade quality, but with a larger cutting format. These desktop models can be used for paper, small photo trimming tasks and arts and crafts, photos and prints, or scrap-booking. 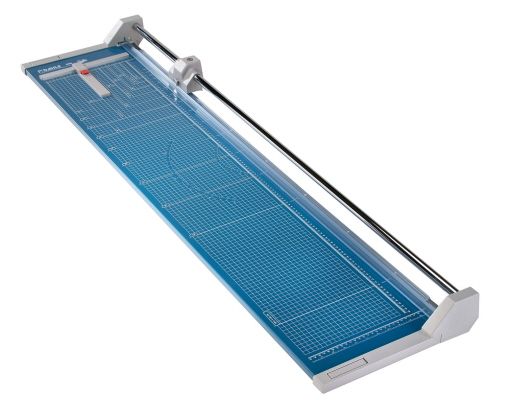 Dahle 550 Professional - Rotary Trimmers is a compact and lightweight cutting solution. It fits neatly on any desktop and can be stored in a drawer or under the desk. The deck on these models are imprinted with standard guides and measuring grids, as well it includes an adjustable guide stop. The Dahle 552 Professional - Rotary Trimmer is a versatile and high quality cutting solution. This trimmer allows for a larger cutting width on projects. These trimmers are designed for heavy duty applications where precision is essential. If you're a photographer and trim photos and prints - this model is our recommended equipment for professional performance! Dahle 440 Premium - Rotary Paper Trimmer is the new generation of paper cutters. Designed for business and professional use, these trimmers are durable, and have longevity over other brands on the market. Made from solid construction material, such as metal cutting plates, and durable plastic - they will outlast and out-perform any other trimmers on the market. 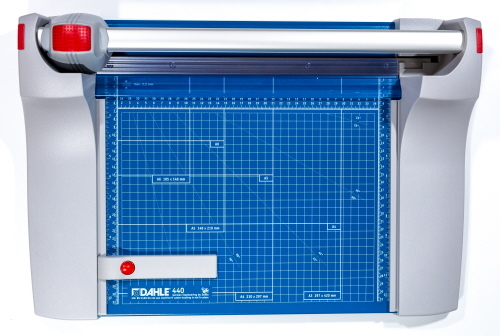 Dahle 554 Professional Rotary Trimmers are wide format paper cutters designed for accuracy and performance. 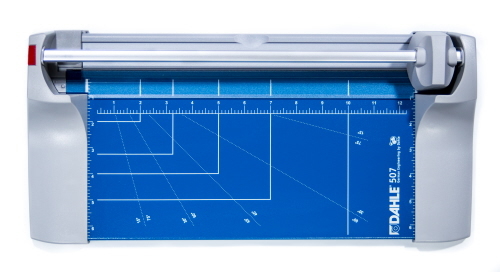 The base is a durable all metal plate imprinted guides and measures. Like other models in this series, they are built using the same high quality standards for longevity and performance. When precision counts for photos and prints, you can trust these professional grade models to out perform all others. Dahle 442 Premium Rotary Rolling Trimmers designed for high sheet capacity and thicker materials. These models include a self sharpening blade which slides in both directions for easier cutting. The 44x Series trimmers are Premium models which can cut a higher capacity of materials. The back stop guide can be used on either side or on both sides with an extra guide added. Dahle 444 Premium Rotary / Rolling Trimmers are versatile and reliable cutters designed for premium users who need accurate and professional cutting performance. With a wide format for trimming, the 26 3/8" cutting length will suite many tasks including photography, architecture, print and copy centers, and schools. 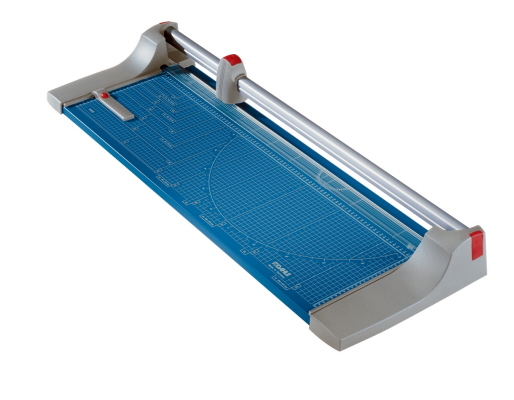 Dahle 556 Professional Rotary Trimmers are designed for large formats. With a self sharpening cutting blade, encased in an aluminum head and mounted on a circular trim bar - this model allows for a fast, smooth and accurate cut every time. The all metal base plate is imprinted with measure guides and cut standards for all jobs. 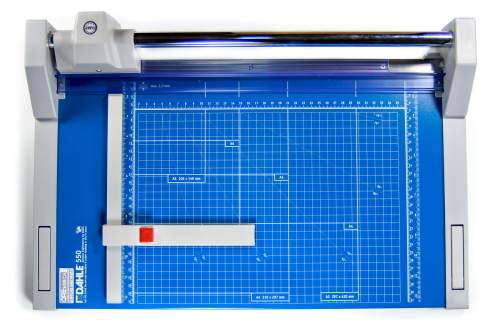 Dahle 558 Professional Rotary / Rolling Trimmers are the best of the best in paper cutters and trimmers. Designed for safety and accuracy, the cutting blades are encased in a plastic housing that virtually eliminates the chance of personal injury. This trimmer has an ultra wide 51" cutting length which can be used by photographers, print shops, architectural firms, and city planning departments. Dahle 446 Premium Rolling trimmer has been designed with an ultra-wide cutting width for larger projects. This model allows cutting in either direction for ease of use. 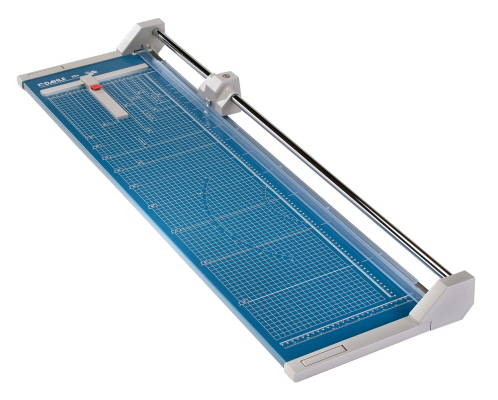 Used by architects, city municipalities and for other applications where drafting or wide paper trimming is required, this model provides the extended length you need. 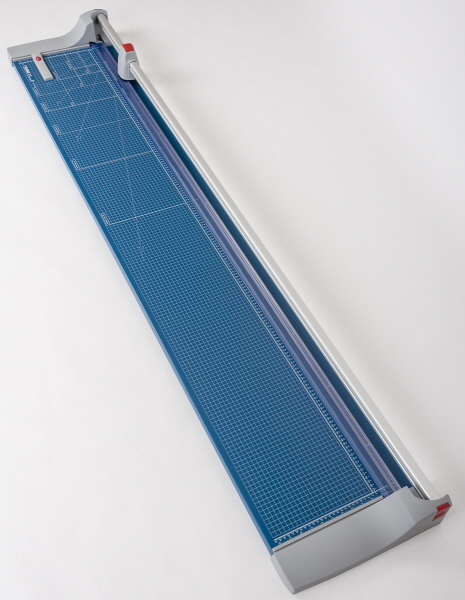 Dahle 448 Premium Rolling Trimmer has one of the largest wide format cutting lengths on the market. The long 51 1/8" width can be used for larger projects for city planners, architects, commercial drawing and drafting - you can maintain a superior precision trim every time. This unit is available for both table top use and for use with an optional floor stand with a catch tray. 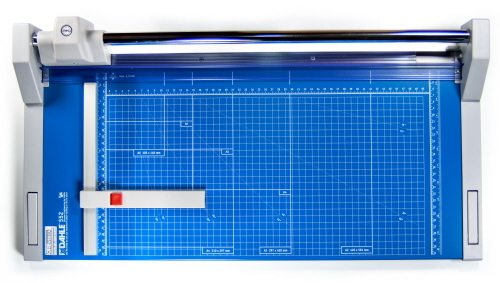 The Dahle 472 Ultra Wide format trimmer is one of the largest width cutters on the market. Designed with the same high quality standards as all other models in the Dahle line. This model will cut a variety of materials other than paper. Cut in either direction with-out having to stop or adjust while cutting. With the Dahle 472 you get the same great features, such as: self sharpening blade, precision cutting guides, automatic paper clamp, and adjustable back-stop (additional back-stop can be purchased for added guide stop accuracy on both sides).